Art can mean so many things to so many people (remember this Porsche based artwork?). It’s probably one of the most subjective topics there is and one of the hardest to define. While we here at 993C4S are not always able to define what art is, we definitely know it when we see it (borrowing liberally from Justice Potter Stewart)! While getting to know Paul, we learned about his various hobbies and interests. 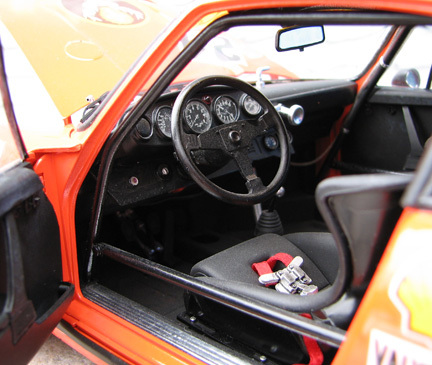 Among other thins, Paul is an avid collector of vintage racing toys and automobilia. As an artist and designer Paul looks for ways to combine his creative and design skills with his passion for collecting. One such outlet presented itself in the form of hi-end scale model building. As the name suggests, scale models are a representation or copy of an object that is larger or smaller in size than the actual item. These models come in a myriad of shapes and sizes and the level of detail can vary greatly from manufacturer to manufacturer. Scale models come in various forms such as pre-built injection molded models, die-cast metal or complex kits (like the one below) that take an incredible amount of time, infinite patience and a steadier hand than ours to complete. Paul always wanted the challenge of developing a highly detailed and exacting replica of a storied race car. However, the acquisition cost of these larger, more detailed kits can be quite high (prices can range from a few hundred into the thousands of dollars) and at the time presented a challenge for Paul and his family. Good fortune and fate came together in the form of a raffle ticket, purchased by his son Laurent at a local model show. When the winning number was drawn Paul and Laurent found themselves the new owners of Tamiya’s #12020 Porsche 934 Turbo RSR 1/12 plastic kit (a highly desirable and out of production racing kit.) Here's a sample of similar Tamiya model kits currently available for sale on ebay. Over the next several months Paul poured his heart and soul along with 350 + hours of his time into the planning, construction and detailing of the kit. 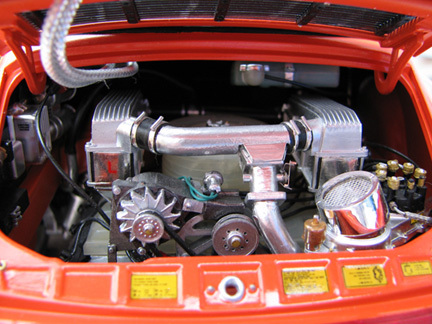 I did extensive research into the engine, hoses and wiring, and interior details to get it right; that includes the scale of those hoses and wiring. I even added weight throughout the whole car so that it would sit right, and actually have some realistic heft when you pick it up. The kit is so detailed that the only extra parts that I had to scratch make myself were the headlight bulbs/sockets, an electronic item on the top-right of the alternator, the shift linkage and the front tow hook. A tradition I started with my early race car kits was to honor my dad's memory by adding a ruby from one of his old watches that he gave me to take apart when I was a kid. I like to hide them in plain sight. On the 934, it's on the bottom far left of the dash; you can just see it in the picture. The car was the main kit, but I knew that Tamiya had made a 1/12 scale race team in 5 separate kits: the driver, the manager, 2 mechanics and a tool set. Through connections, I managed to get the 4 figures, all of which have some tools, and the driver's helmet. 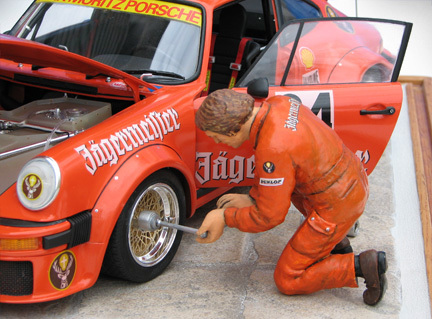 I decided to build the tire mechanic, add some of the tools (modified for the 934) and the driver's helmet. This mechanic is my first stab at figure painting. Since the Tamiya orange spray paint is enamel, and glossy, I decided to custom-mix the acrylic for the mechanic's suit. The graphics (stitching) are decals I printed. They were tricky because you can't print white. For example, I applied the Jagermeister decal on his back, painted in the white, and then finished it with another Jagermeister decal on top. The Dunlop patch is a carefully trimmed laser print which I varnished, then glued into place. I made the base from scrap oak hardwood flooring and a piece of scrap plywood. I had a friend cut a piece of leftover tile, which had the look I wanted. I had a custom acrylic cover built to my specs, and finished it off with a pewter plaque. We will have more of Paul’s work in the coming weeks as we review some of his Porsche based drawings and implement the logo/illustration he designed for our new site PorschPurist.com (that’s a thumbnail of it to the left). For right now, if you would like to see Paul’s artwork or further explore his vintage toy collection you can do so by choosing any of the following links. Coincidently, we just received our own Porsche model courtesy of the good folks at Tamiya. The Porsche 911 GT3 Cup VIP 07 is an electric RC kit (we’re big, big RC fans.) We will be working on this particular kit over the next couple of weeks, spending some time with it on the track and reviewing for your enjoyment, so stay tuned. Paul, that is some incredible work! As always, I’m impressed as hell! Incredible detail. Thanks for the hard work and fantastic result, Paul. Thanks for the review, John. Gorgeous work! I still have mine that I built back in 1985… glad Tamiya brought this scale model back. I want to do another. I actually have been in the real deal in Stuttgart some years ago and again at Monterey Historics a few years back… these cars simply were so far ahead of their time… much like the 917s and 962s. Thanks for sharing! Thanks for the kind words, and John, for the great review. It’s nice to able to show it off, and to get such positive reaction. I’ll have to start building again. I have found a kit of it, but some pieces are lost, like the instruction and the disk brake. I hope to find all, or I have to buy a new kit! Please, do you know links where is possible to find documentation or photos of the original car? Do you a website, with description of your work on this kit? I did extensive research on the web to find my reference; I still have the image files. Please email me at paul.chenard@hotmail.com and I will send them along to you. As for your missing parts, you can probably manufacture them yourself, as long as you have one part to refer to. I can scan the instructions for you too. If you could forward my note along to Maurizio, that would be great. Thanks! I think that for the instructions there are no problems, but the image files are too big? About the missing parts, I thought to make them by myself, now the only parts that I know that are missed are the disk brakes, but I’m not sure that are only these. What do you think about the photoetched parts of the new kit? I would to ask to Tamiya Italy if it is possible to have them. I saw your website, you are an artist! I’m writing now to Paul. No problem on writing your email address. Some people don’t like to do it as they might get spam! If you want me to remove it at some point, just let me know. I’m sure you’ll hear back from Paul shortly. If not, let me know and I’ll get in touch with him for you. Paul is very kind, he has just answered to me. I would like to publicly thank Paul. he sent me all the photoes and instructions of the Porsche 934 Kit. Paul has helped others in the past with the instructions. If you don’t hear from him shortly, let me know and I’ll get in touch with him for you. I’m a committed Porscheaphile, lucky enough to own two real cars. Back in the 80’s I made the same 934 kit as well as the 935. Beautiful kits and it’s a shame they are not available anymore.